The new Knitty is up and with it, my first ever published pattern, the Venezia napkin rings! They are absolutely beautiful! Very creative. I was looking at all the patterns in the new knitty... it wasn't until I scrolled through the pattern to the designer bit at the end and saw "Designs By Romi" that I realized "Hey! It's her!!" Congratulations on your lovely napkin ring pattern. I'm thrilled to find it - something wonderful to do with all those beads I'd been "collecting". Those are amazing! Also, I didn't realize until I clicked through to your blog that you're the woman I bought a shawl pin from for my mom for Christmas! You're a very talented lady. Had to drop by from Knitty and let you know that these are beautiful. I love your pins, too! Congratulations on your published pattern. The napkin rings are just lovely. I lovelovelovelovelove the napkin rings!!! I've been hooked on knitting w/ wire and beads from the handknit holidays votive sleeves! 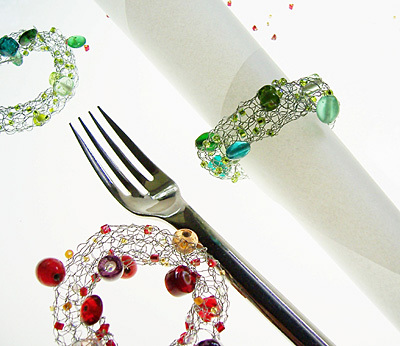 You're napkin rings are so delicate and gorgeous, and excellent job on the pictures!!! Too bad I won't have time to knit them as presents for the holidays! With a set of crisp linen napkins it would be an awesome present! Thanks for your beautiful pattern and making a wire knitting convert of me! This stuff is truly addictive! I haven't checked out Knitty yet (but will as soon as I finish blogrolling) but Venezia is gorgeous! Just utterly, beautifully creative. Rosemary, what a great pattern. These would make an excellent housewarming gift!